There is a choice of construction materials for the OG2 flowmeter, including totally non-metallic wetted components, like ceramic, a choice of elastomer, and PEEK for metering aggressive chemicals. OG2 flowmeters are compact and have a rugged design, which allows them to operate reliably even at higher pressure, providing steady performance with minimal maintenance. Furthermore, OG2 flowmeters are able to operate at temperatures up to 150°C and are fully IP67/NEMA 4 compliant. Each OG2 flowmeter comes with a pressure test certificate that verifies the device's ability to handle pressures up to 700 bars (for OG2-700 model). 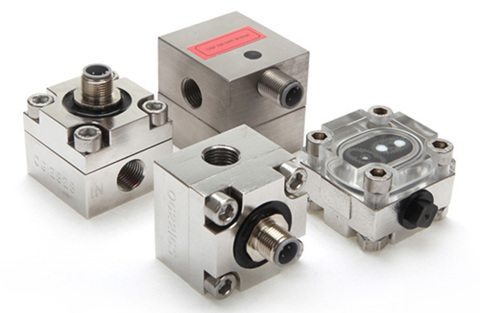 With a standard flow range from 0.03 to 4.0l/min on 30cSt oil, OG2 flowmeters are able to regularly achieve outstanding repeatability (0.1%) and accuracy (0.75%). Applications that have benefited from OG2 flowmeters include monitoring hydraulic fluids in earth movers and wind turbines, chemical pump testing, measuring sulphite spraying in a vineyard and for medical dosing. For further information on the OG2 flowmeter range please visit www.flowmeters.co.uk/og2-positive-displacement-pd-oval-gear-flow-meters-swept-volume-flowmeters/ or contact Titan Enterprises on +44-1935-812790 / sales@flowmeters.co.uk.